Blog Designer is a good handy and free solution for everyone who is looking for a responsive blog page with the website. Blog Designer provides you with a variety of 6 different blog templates to setup your blog page for any WordPress websites. Sometimes, we always stick with one blog layout as per theme, but it’s not easy to change or modify only blog layout very easily, only you can do it by modifying code and css files. However, using Blog Designer plugin you can design your blog page as per your choice to give it a WOW factor. Also you can modify various settings very quickly from admin side as Blog Designer plugin has User Friendly Admin Panel. So, beginners can start blogging within 5 minutes, no coding skill required. You can show your new blog page design with any page via below shortcode. NOTE: We have updated Blog Designer plugin’s backend UI from new version 1.8.7 for better usability. So, kindly clear the browser cache if you are facing an any issue with backend design or layout settings after upgrading to newer version of plugin. Show/Hide Post category, tags, author, comment counts, etc. Style your content with wide variety of options like text color, background color, font size, etc. Pro version overcomes your limitations with lite version of blog designer. 40+ Default Blog Templates with 200+ option combinations and more coming soon! Page Builder Support for Visual Composer, Divi Builder, BE Page Builder, etc. Multiple order by options – Published/Modified Date, Post ID, Post Title, etc. Where Blog Designer Pro plugin is useful ? Activate the Blog Designer plugin from Admin > Plugins. Does Blog Designer give me total control of my blog page? Yes, Blog Designer gives you total control of your blog page. You need to just setup everything correctly and play with it. You may get more than your expectations. Does Blog Designer design my single post pages? No, this featured not covered with free version plugin but you can design your single post pages with the help of ‘Single Post Layouts’ in PRO version plugin. Does Blog designer provide some default blog templates? Yes, Blog designer provides 6 default blog templates – Classical, Light Breeze, Spektrum, Evolution, Timeline and News. And in Blog Designer PRO version, there are 40+ unique blog templates available for category, tag, date and author archive pages. Those same blog templates compatible with single post pages also. I have used your blog designer shortcode with page or already selected a specific page for blog section via Blog Designer panel but still I am not getting blog layouts design as per you are showing in your demo site? 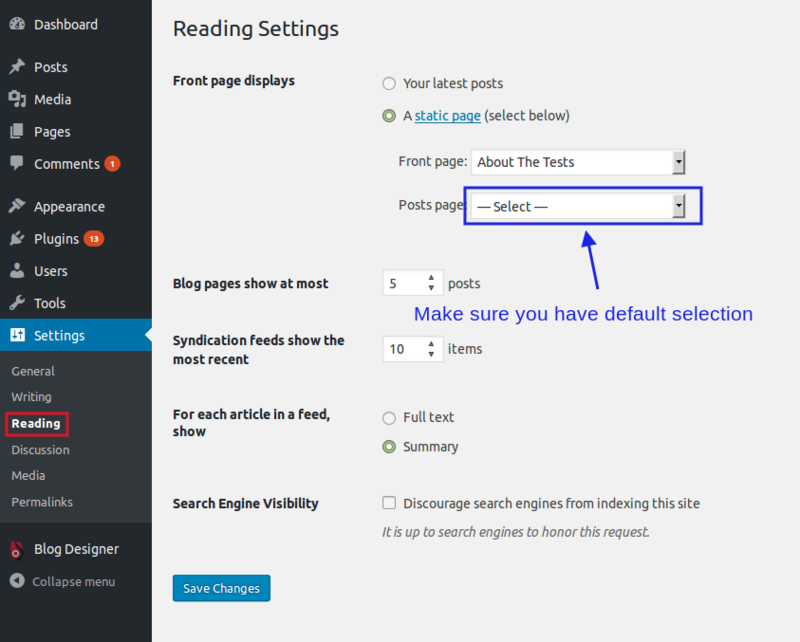 Please login with your WordPress admin panel and go to Settings > Reading and find option Front page displays. If you have selected an option as ‘A Static page > Posts page’ with your same blog page then please change that selection with default value settings. For more details, please check this screenshot. Can I apply this blog designer only for my hot categories? Yes, there is one backend option available as you can select multiple categories and blog designer apply for that categories only. Is there any social option available as I can add social share button on my blog page with every post? Yes, Blog designer providing option as you can add social share on blog page with 2 different shape options. You can get more advanced options in PRO version. In PRO version, there are 10+ social style templates. Can I control my content length on blog page? Yes, you can. “Post Content Length” option will give you ability to control your content characters on blog page. I want to hide post details like post author, post date. Can I? Yes, There is “General Settings” panel where you can manage your post details as you want to show or not. Can I manage my “Read More” text on blog page? Yes, you can change that text and decorate it also whatever you like. Can I create post sliders with the help of Blog Designer plugin? Yes, there are 3 slider templates – Crayon, Sallet and Sunshiny slider included with the plugin. In WordPress 4.7, there is new feature available as “Post Template”. Can I create multiple single post layouts even if I don’t use of this post template feature? Yes, that option available in PRO version. There is no coding skill required to create unlimited Single Post Layouts with the site. What about custom post type support? Custom Post type support only available with Blog Designer PRO version. Where can I get support or talk for blog designer issues? If you get stuck, you can ask for help with Blog Designer plugin Support Forum or can create a ticket at our Support Portal. Will Blog Designer work with my theme? Yes, Blog Designer will work with any WordPress themes, but may require some styling changes to make it compatible. If you are facing any compatibility issue with Blog Designer plugin then please contact us at Support Forum. Great template and easy to use. I have never had such a disaster. My site no longer has pages, only posts after installing this plugin. Not recommending this AT ALL! Easy to use and sleek design, thanks! Still getting used to it but seems to be doing what we need and want it to do. “Blog Designer” is open source software. The following people have contributed to this plugin. Translate “Blog Designer” into your language.